During Tiger Woods’ comeback I watched via Twitter. The account @twspot tweeted a shot by shot account of all of his four rounds, amazing! I reached out via Twitter and Instagram and the owner of the account agreed to answer some of my questions, let’s jump straight in. Hi TWSpot tell me a bit about yourself: Hey there, my name is John, I am 20 years old and from Ottawa, Canada. I am currently studying commerce and in my 3rd year at University. Why did you open @twspot on twitter? My account was sort of started by accident. It was the 2014 PGA Championship at Valhalla that started everything. 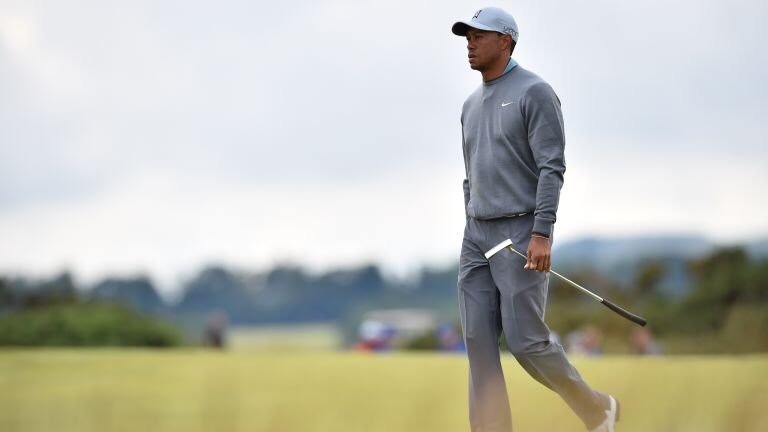 If you can recall, Tiger had not announced if he was going to be playing or not due to his withdrawal the previous week at Firestone for the WGC Bridgestone. There was belief that he may play but it was up in the air. On the Wednesday morning of tournament week, he had still not announced his intentions. Media began to assume that he would maybe show up but still weren’t really sure. Many cameras were fixated on his parking spot at the tournament, which had a reserved sign. I was watching Golf Channel, waiting in anticipation like everyone else. I believe it was Kelly Tilghman who had said on air “How long will it be before Tiger’s parking spot has a Twitter account” … That is when I made the page @TWspot, I was speaking as his parking spot and got featured on the Golf Channel within minutes. Here it was mentioned in Bloomberg: http://bloom.bg/2hmqyd1 – scroll down a bit. After that whole situation had come and gone, I decided I would turn it into a fan account. I would track each shot from every tournament and tweet out the updates. That is primarily how it has grown. The page is a community where fans of Tiger Woods can come and interact with one another. About a year later, I began the @twspot Instagram account, which has grown tremendously and is now the largest fan account for Tiger’s fans, with over 27,000 followers. I am super proud of both pages and have put a ton of work into them. Many celebrities follow the page as well, including Steph Curry, on the Instagram page. Do you play golf? I play golf when I have the time. I was a member at my local country club the last 5 years, but didn’t have the time this past summer. I play when I can though. I enjoy golf, it’s a great sport to play. Even on the tough days, its still fun. My game is nothing special, handicap was about a 16 the last time I had checked. What clubs do you use? The Clubs I use are probably in need of updating as well but I have Nike SQ irons (Tiger used the SQ woods and driver around 07-08) and hybrids, TaylorMade R1 driver, Nike method putter. When did you become a fan of Tiger Woods? I have been a fan of Tiger’s since 2008. That was the first tournament that I remember being full engaged with. I recall watching Tiger make the putt on 18 to force a playoff and that was just an incredible moment. That’s the day I became a fan of Tiger Woods. What made you become a fan of TW? I am not embarrassed to say it, I am just absolutely fascinated and obsessed with the man. I just believe that he embodies true greatness and pure athletic ability. Since 2008, I have followed Tiger so closely, every move really. He never gives up on a shot and that’s the approach that I take to life. As bad as something might be, you have to keep grinding because you never know what the outcome will be. Is that what keeps you being such a passionate fan? Tiger has been through a lot in his life personally as well, and I look up to that. He has dealt with the loss of his father as well as his own personal struggle in 2009. I have also been able to witness the growth of his role as a father and how seriously he takes that role, which is truly great to see. I will always be a fan of Tiger’s. The main reason I continue to be a fan though, is because I believe that there is still some greatness left in the tank. There is no reason for me to believe that he can’t win more majors and tour events. I believe there is a lot to come still from Tiger and that’s what makes me continue this journey. How have you coped with all of Tiger’s negative times? There have been quite a few! There have been a lot of negative times for Tiger, but I have always kept faith because time and time again he has come back and performed. After the events of late 2009, many people said that he will never win another tournament again. He not only won many more, but also returned to the number one world ranking after those events. We all know who Tiger is and what he can do out there when he has put the time into his practice. I believe that if he is now finally healthy, he can be successful again. He has too much talent and natural ability to not thrive in the competitive environment. It takes a special type of person to be able to win as much as he has done, especially the majors. The negative times only strengthen the passion for Tiger. If this past year taught me anything, it was definitely patience. I continued to grow my community, while the guy was on the sidelines. It wasn’t easy at times, but it also allowed his biggest fans to take a moment to appreciate all he has done for the game and think about what is still possible in the future. I have found the most passionate fans of Tiger Woods and am proud to be able to bring them together through the community. How do you feel that Tiger’s comeback went? Tiger’s comeback was tremendous. There were numerous times that he attempted to come back this past summer. It began at the Masters. Although its tough to believe, he attempted to come back there. He ramped things up and was ready to play. He knew that he could do it, but the risk of further injury was too grave. I think this was a big deal for him because he realized that this injury will require great patience. Throughout the summer, he contemplated his comeback at several different locations but in the end, figured he would just wait it out until he was 100% and have the necessary endurance to be able to play. After he skipped the Quicken Loans National, I figured it could be a while and at that point, I accepted that. Whenever he came back, would be great for golf. The run up to the Hero was exciting, we knew he would play that event. I feel good, just knowing that he feels better and can practice without pain now. I didn’t expect much from the Hero, he certainly showed so many signs of promise from the event. I really had no expectations going in but I knew he could show signs of his old self if he felt good about his game. I think the week was a tremendous success considering everything he has been through. His expectations for 2017 are likely very high. I am excited to see what Tiger can do and I think that if healthy, he has many good years left. Thanks for your time, let’s do this again but next time on the Impact Golf Podcast! Next Top 5: Which Panama Hat for Golf ? Enjoyed your article on Tiger, Guy, and your transparency. I for one did not know who Guy Cross was. Do not be disillusioned that there are some previous Tiger fans that lost some respect for him due to some of his unsavory personal life in the middle of his career and when he was trying to win more Majors than Jack Nicholas. Again, thank you for tevealing yourself Guy Cross. Following you.